Time to Sell Gold Stocks? 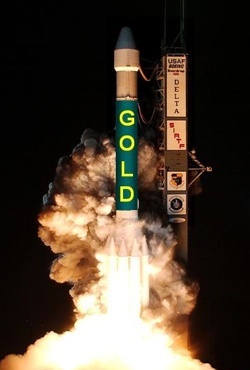 The rocket ship has finally blasted off for precious metals investors, who have seen massive portfolio gains over the past few months. Gold is up 17%, while silver is up a blistering 29% since late July. The Gold Miners ETF (GDX) advanced 23%, but the smart money was riding on the Silver Miners ETF (SIL), up 37% in just over two months. Not too shabby considering the S&P 500 is up just 10% during the same time period. But investments don’t go up (or down) forever and astute investors are starting to question whether now is a good time to sell gold stocks. After all, there is certainly nothing wrong with locking in some profits after such a powerful advance and having cash to buy back at lower prices on the anticipated dip. Precious metals look to be extremely overbought. Commercial traders have shown little sign of covering short positions and the spec funds have been decreasing their long positions as of late. Furthermore, the mid-term elections look sure to shrink the Democrats majority and push Congress towards gridlock, which is usually good for the economy and bad for gold. The theory states that the less Bernanke and our centralized planners get to print, spend, and “stimulate,” the stronger the dollar and lower the gold price is likely to go. But both parties have shown their willingness to debase the currency, bail out failing companies and get behind stimulus bills in order to appear as if they are doing something. And even if we were to see gridlock on Capitol Hill, it might already be too late to stop the snowball of inflation, death of the dollar and ascent of gold to $5,000 or higher. Remember, it took nearly 200 years for the first $800 Billion in dollars to be printed and our leaders have more than tripled that amount in the past two years alone. This money is finally showing signs of leaking into the economy with a sharp rise in food prices. Once the velocity of the money picks up, look for skyrocketing prices for all commodities with a bias towards monetary metals. Physical buying has been remarkably robust and central banks around the world have switched from being net sellers to being net buyers of gold and silver. Rumors are also ablaze of a few very wealthy investors in China, Russia and elsewhere buying up as much physical metal as they can get their hands on. Considering the ever-expanding sea of fiat dollars floating around the world and the relatively small amount of physical gold and silver available, one could envision a scenario where metal prices continue much higher. Some have even forecast a gold price of $15,000, in order to cover the amount of paper currency in existence. So the question remains, could this be the start of a parabolic top like was witnessed during the start of 1980 or are precious metals about to correct? Is now a good time to sell and lock in gains? Gold’s current price chart looks similar to that of late 1979, when the gold price blasted above its previous peak, began a short consolidation and then doubled in just a few months time. If history were to repeat and the price were to go parabolic, gold could easily blow through $2,000 in the coming months. But I am not convinced that we are there yet. 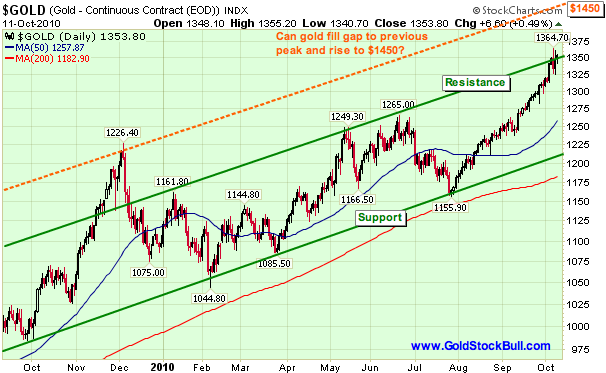 I think we are more likely to see a correction toward the $1,250 area and short consolidation as gold has reached the upper resistance of its trend channel (solid green line). The other potential outcome is that gold will blast through the green resistance line above and create a new upper line of the trend channel (orange dotted line) that corresponds with the previous December 2009 peak. This is why it is key to watch the gold price closely around the $1,350 area where it has recently run into resistance. If it can break higher from this point, I believe it will be a quick ride towards $1,450. If the gold price fails to break out above the current level, it has likely put in a top for this upleg and will correct to support at $1,250 at minimum, with a potential drop to bottom trend line around $1,200. Most traders fall into one of these two strategies. You either have the time, resources and desire to trade stocks with the hope of increasing returns or you do not. While most investors are better off to use the buy-and-hold approach with mining stocks, I prefer to utilize a mix of these two strategies and have had success increasing returns by doing so. I allocate approximately 50% of the Gold Stock Bull portfolio to long-term core positions and trade with the other 50%. David Morgan prefers a mix of 75% buy-and-hold and 25% trading, but the final breakdown is up to your own particular situation. The second major consideration is the tax implications that you will face. If you are trading in a retirement account that is not taxed until withdrawal, you can sell some or all of your positions with the view to buy back at lower prices during the correction. You don’t have to worry about selling early and being taxed at the full rate, but you will endure much higher trading fees than using the buy-and-hold strategy. Assuming ten positions and using a trading fee of $10, if you sold and bought back three times in a year, you would incur an additional $600 in trading fees. Your broker might love that approach, but you have to factor in this extra cost when determining the impact to your overall portfolio performance. If you have a non-retirement trading account and have not held your position for a year or more to qualify for taxation at the capital gains rate, you are likely going to be taxed at the full rate, prematurely turning over a portion of your wealth to the government. These are your funds that otherwise could have continued to appreciate. Investors in this situation can opt for other methods of protecting profits from an anticipated correction, such as purchasing put options which are currently at a low premium on mining stocks. Put options give investors a low-cost way to hedge their long positions without the accumulation of trading fees and negative tax implications. Please note that I am not a tax or investment advisor and you should consult with one before making any decisions. I use both an non-retirement account and an IRA in my investment portfolio. I trade more frequently in my IRA and use my regular account for long-term positions with occasional option hedging. When I am correct with timing, my portfolio advances full steam during the uplegs and incurs minimal damage during the downlegs. It is truly the best of both worlds if you can manage to get the timing somewhat close on the peaks and troughs. With gold currently stalling around the upper resistance line at $1,350, I am leaning towards the likelihood of a correction in the next few weeks driven by profit-taking from the longs, short selling by the commercial traders and anxiety around the mid-term election results. This seems like a good time to book at least a portion of recent profits in retirement accounts, open a small hedge in regular accounts and be prepared to aggressively buy the dip if gold should correct back to the $1,200 – $1,250 range. There is plenty of money on the sidelines waiting for the dip, so I believe it will prove to be an excellent buying opportunity and don’t anticipate it will last long. In the longer-term, as countries around the world race to debase their currencies and keep their exports competitive, I think the gold price will easily eclipse $2,000 during 2011 and reach $5,000 or higher before the bull market concludes. It will be one of the greatest transfers of wealth in history from those holding paper currencies to those with tangible physical assets such as gold and silver. Which side of the transfer will you be on?